The G4 battery is not compatible with either NFC or Google Wallet. 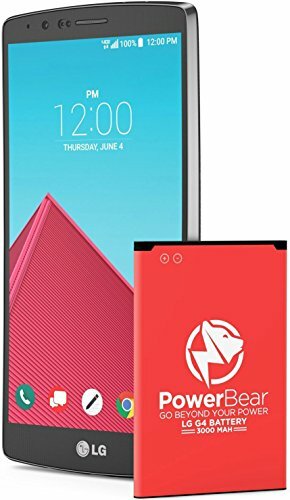 - This PowerBear spare battery for the LG G4 is designed to deliver up to 400 hours of charge. - Created from certified Grade A+ battery cells that provides a capacity of 3,000 mAh. - Quality connecters provide optimal connection to your phone. - Quality assurance with state of the art testing. Can withstand drops and impacts in your phone. Safety Guaranteed. - Failproof built-in IC that monitors temperature and input to protect you and your phone. - Built to last with up to 500 cycles. - Weight: 1.6 ounces oz. Keep yourself powered with PowerBear Phone Accessories! We offer top quality products to reliably ensure that you and your phone are always energized. Products include battery cases, extended batteries, spare batteries, cables, and all your power needs. We're dedicated to making your life easier by taking the responsibility of keeping your phone charge away from you. Using PowerBear products will change your life! HIGH QUALITY GRADE A BATTERY CELLS: This PowerBear LG G4 Battery is manufactured and tested under strict quality control standards. This battery LG G4 will provide you with up to 500 Lifetime Charge Cycles with a high-speed and efficient charge. The best LG G4 battery replacement on the market! COMPATIBLE WITH ALL WIRELESS CARRIERS: Our battery for LG G4 is compatible all major wireless Carriers for the LG G4 (AT&T, T-Mobile, Verizon, Sprint) including the following models: LG G4, H815, H815TR, H815T, H815P, H812, H810, H811, LS991, VS986, US991. REPLACEMENT / SPARE BATTERY G4: Swap out your old G4 battery with a brand New PowerBear battery for G4. With a built in chip to prevent over-charging and over-heating, this LG G4 replacement battery will keep your LG G4 powered. SPECIFICATIONS: This G4 replacement battery has a capacity of 3000mAh. The Battery type is Lithium Ion, the Voltage is 3.85V. 24 MONTH WARRANTY: This G4 battery replacement if backed by PowerBear's 24 Month Warranty. If you are not 100% satisfied with your LG G4 batteries, just let us know. Customer satisfaction is our #1 priority.